Night markets open along Cheonggye Stream, at Dongdaemun Design Plaza, riverside parks in Yeouido and Banpo, and next to the World Cup Stadium in Mapo-gu this weekend, featuring food trucks and handmade crafts from around the world, games, cultural performances and preloved items, Seoul City said Friday. 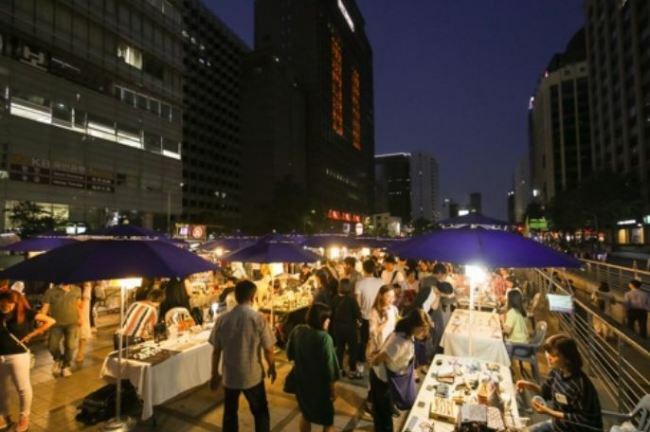 People can exchange items they do not need at a designated spot in Cheonggye Plaza throughout the Seoul Bamdokkaebi Night Market, which runs through Oct. 28. An open audition will be held at the market site in Banpo, using a free karaoke machine. There will be a lighting balloon festival at DDP. Rooftop rest areas will open atop information offices in the Banpo and Yeouido riverside parks. Soldiers on leave and people celebrating birthdays or other personal anniversaries will be given tickets to use the rooftop spaces. Coupons to use at the food trucks will be given away via lucky draws to people participating in games at the markets.